Here’s your chance to win an iced cofee (or iced tea) maker today. Over the spring and summer months, when it gets warmer here in CA, I love iced coffee. 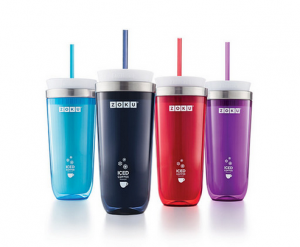 That’s why I was so excited to see today’s giveaway—the Zoku Iced Coffee Maker. Three AFH fans will have a chance to win one. Since coffee is considered a “healthy” beverage, we’re all about helping you indulge in one of your favorite ways to start the day. Remember, the new Dietary Guidelines Advisory Committee suggests that about 4 cups a day of coffee is fine for most of us (less if you’re pregnant or nursing). You may know Zoku for their widely popular popsicle makers, but the company has lot of other nifty products too. This novel iced coffee maker turns your hot coffee into iced coffee in as little as five minutes. You just store the stainless steel mug in your freezer, then add it to the sleeve and pour in your coffee and put the lid on it. I like my iced coffee diluted a little, so I add ice cubes too. The mug is also spill resistant and has a straw, so you can take your iced coffee with you. Entries will be received until Monday, March 9, midnight EST. I like coffee because it wakes me up in the morning! I love (flavored) coffee because sipping a cupful helps me decompress. BTW, I also love my Zoku popsicle molds. Of course, I liked them on FB. They make useful, reliable products. It gives you that warm fuzzy feeling! I;m from New England – we drink iced coffee all year long! I nice black coffee with a touch of honey makes my day. Now an easy ice coffee in the afternoon would keep the day going. I love iced coffee because it is so refreshing all year round. WooHoo!!!! I love coffee because it keeps me going in the morning, in the afternoon and throughout the evening! This would definitely be handy on those especially hot summer and spring days! I’m an email subscriber and facebook fan too! I make a strong pot of French Press coffee in the morning and later in the day this coffee makes a great iced coffee. I’m a huge iced coffee nut! This looks like a fun and easy way to get my fix! I already follow both FB pages and I shared on Twitter and FB. Thanks! The one thing I love the most about coffee is it smell, sooo good! What a cool concept this mug is, awesome for the summer months ahead! I love coffee because the aroma makes me crave it! Coffee tastes delicious and it is healthy. Coffee is my morning ritual and keeps me happy. Ditto for all the above requirements and this sounds awesome for a quick and energizing refreshment anytime. I’d enjoy making iced coffee for my family too! I have to had my 2 cups before I can fully wake up in the mornings–then need another for a wake up in mid-afternoon!! Love coffee with dessert!! Iced coffee in the summer!! And dessert coffees are always welcome!! I love having different flavors to choose from to suit my mood! I love coffee because it can be flavored in so many ways, drank hot or cold, and wakes me up in the morning. I love coffee because it tastes so good! I love to customize my coffee the way I like. I love the flavor of coffee and the little pick me it up it sends when I enjoy a cup. I love iced coffee because it is delicious and refreshing. Coffee is my wake up drink which warms me up for the day. Coffee warms and wakes me up in the morning. I love coffee for its energizing effects and health benefits. Life without coffee would be difficult! I drink coffee daily (who doesn’t) and have been looking for an easy way to make iced coffee. I love everything about coffee. Gets me going and keeps me going. I like the social aspect of sharing a cup with the people I love. Liked & subscribed. Coffee is the best way to start my day….after my workout. I love iced coffee when it’s hot, but have no easy way to make it. I’m looking forward to hotter days….and colder coffee! Thank you for the wonderful giveaways! Coffee is something I look forward to every morning! It tastes good and holds me over until breakfast. I “Liked” Zoku on Facebook. I Like both AFH and Zoku too! I Like AFH on Faceboo and Zoku too! I love the many different ways to enjoy coffee and all the great tasting flavors, too! Coffee makes my day better because it gives me the boost I need and it makes me happy. I love enjoying a cup of coffee with my mom. We always have great conversations together over a cup of hot coffee. What a neat idea. I start most mornings with iced green tea to feel refreshed. I love started my day off with a nice cup of coffee to get me going! I love coffee any way that I can get it – hot, cold, frozen – I like the taste and it’s a nice pep me up! Coffee is my “me” time every morning. Work, home, husband, kids… most of my time is spent taking care of other people. My morning coffee is a small way I take care of myself! long hours are rough and the caffiene without a lot of other crap (ie soda/ energy drinks) is great! I just love coffee – what more can I say? I have my own pot separate from my husband because he likes colored water and I enjoy a good strong coffee! I would love to make iced coffee during the hot summers here in Arizona! Thanks for the opportunity. I love the pick me up coffee gives me. Zoku & Appetite for Health both liked on FB. I receive your newsletter and love the articles and recipes! Iced coffee is so refreshing after my long, early-morning runs, especially in the summer! I love coffee because of the healthy phenol boost and because it provides an opportunity to talk about things that matter with people I care about (building relationships while sipping on java = fulfilling experience!). I love coffee because it helps keep me up while I am working long hours and I really like the taste of coffee. I love coffee because I love the taste and I could not start my day or function theough out the day without my coffee. I LOVE coffee as it helps keep me energized and focused throughout the day! Fan and email subscriber too – Thank you! I love to smell coffee and it helps me wake up and keeps me alert! I love coffee because it’s reliable, versatile and delicious. I can always count on it for my morning pick me up, mid-afternoon break with coworkers, or my post-meal digestive. It’s so versatile in its origins, blends and the ways it can be prepared – meaning that I never have to settle. I can pick my roast, dress it up as I please, and enjoy it on the go or as I relax. It’s the perfect companion throughout my busy days! Who doesn’t like iced coffee?? i LOVE it!!! I would also love to try making iced tea in here! I signed up with the links you asked for.. I love ice coffee especially in the summer! The winners of the Zoku iced coffee maker include Kari, Sharon and Jules. You’ll receive an email from us on how to claim your prize.